Have you troubleshot your Harbor Breeze fan yet? Only after troubleshooting, should you come to the conclusion that you need replacement ceiling fan blades. If your ceiling fan is making humming noises, did you try troubleshooting? If you have used a blade balancing kit, is one of your ceiling fan blades warped? You can check the distance of each blade from the ceiling to see if one blade is warped. If so, that blade will be an inch or so further or closer to the ceiling. If you’ve gone through the troubleshooting with a blade balancing kit, and that has not solved the problem, then you need to determine if the blades on your ceiling fan are warped. Using a measuring tape, measure the distance from the ceiling to the tip of each blade. Each blade should be the same distance from the ceiling. Sometimes, a dust buildup over the years accumulates on top of the blades. Without proper maintenance and cleaning that dirt off over a number of years, the fan blades actually start to warp a little bit when they are in use. As such, you’ll often find one blade which is just one inch shorter, or longer than the others from the ceiling. Once you’ve found that blade, use a blade balancing kit to try and bring it back into the fold by using small weights that attach to the blade. To replace the warped Hampton Bay Ceiling Fan Blade, you’ll need one of the same length that matches the other blades. It’ll also need to match in terms of color and decor. You’ll need to take a look at Home Depot’s online website, or call the manufacturer. If all else fails and you cannot find a replacement blade, try looking at a universal ceiling fan blade that can take the place of the existing. If you do need replacement blades, you can find them on websites like amazon, home depot, and just from Google searching. We also have links to websites and/or listings here of replacement blades, too. 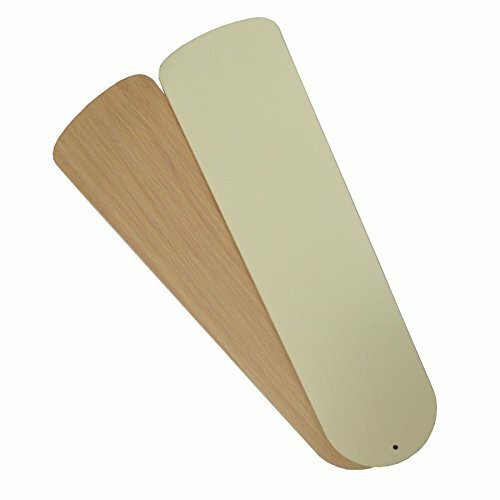 If you can’t find a replacement blade for your exact fan, that matches exactly to the make and model, then you can also try a universal ceiling fan blade kit. Being able to replace the existing blades with ones that are the same color, is always preferable. If you have to replace the blades and the replacements are not the same color, you will have mismatched blades. It will look weird when the fan is turning. A good thing about Harbor Breeze fans is that there are not too many different colors. Also, a replacement blade set will have two different colors or finishes, in order to match more effectively to the existing blades. The below 5 pack of harbor breeze blades are reversible. This is a white/oak pack. The blades are generally easy to install. These blades will replace existing blades on your ceiling fan if you are missing blades or have warped blades that need to be replaced. These replacement blades should only be used on indoor fans.